Chadia Yacoubou stood looking toward a door that, when opened, would reveal the person who gave her a new kidney — and a new chance at life. Seconds later out walked Claire Merwin. The two young women grinned at each other, tears forming at the corners of their eyes, as applause and laughter broke out among the family, friends, and members of the George Washington University (GW) community gathered to witness the meeting. 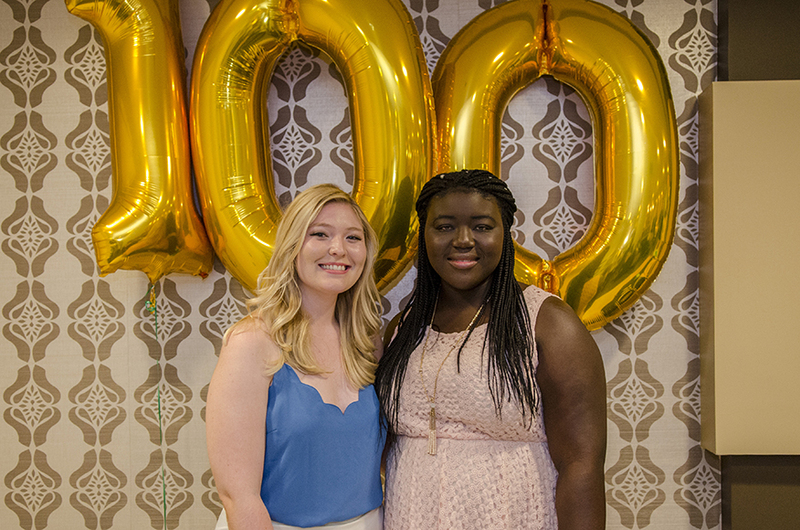 Yacoubou and Merwin represent the 100th kidney exchange through the GW Transplant Institute. Of the now more than 100 kidney transplants completed at the institute, 24 were from live donors, and six were “non-directed” donors, or people who gave a kidney without a recipient in mind. Merwin was one of those non-directed donors. At 19 years old, she decided that since she had a kidney to spare, she would give it to someone who needed it more. One year later, her kidney found its match in Yacoubou. Yacoubou, who had been waiting for a kidney for seven years — since she was 18— said when the institute called her and told her they found a match, she couldn’t believe it at first. Both women said they were initially nervous about meeting one another. “I thought, ‘what if she doesn’t like me?’ ” said Merwin. Yacoubou laughed. “I thought that too!” she said. But as they looked at one another, both agreed that there was no doubt they would stay in touch. The meeting was a milestone for the GW Transplant Institute, which opened its doors about two and a half years ago. “I’m so happy you all are here, not just because we’re celebrating a huge landmark for our program, but because we’re celebrating teamwork,” said J. Keith Melancon, MD, chief of the Division of Transplant Surgery, director of the GW Transplant Institute, medical director of the Ron and Joy Paul Kidney Center, and professor of surgery at the GW School of Medicine and Health Sciences. Melancon then pointed to his cufflinks, circles of gold engraved with the motto for Harvard University: veritas. “Veritas is Latin for truth. When I think about truth, I think about our program because it is this search for truth that all of us have to undergo in order to become excellent,” Melancon said. For the GW Transplant Institute, 25 percent of its live donors so far have been that kind of person.